as a shepherd and also does some farming. He has 4 sisters and 4 brothers so there are 11 people in the family altogether. He gor poli as a child and is left with some post polio leg disabilities. Due to lack of medical facilities in his village he was not able to take proper treatment. He desired to go for studies but his parents were very concerned of how he would mingle with rest of the children in the school and manage his life. Therefore their parents decided to take care of him at home and did not send him for school. He told that,”I would see my friends attending school and studying but I did not get the opportunity to attend. At an early age itself I started to help my father in farming and would take care of his farm. I worked as a mason to earn my livelihood after I grew up. But I wanted to do something more and started to learn stitching. As in my village there were not enough facilities to learn and know about stitching I tried to find people in Leh. So I came to Leh where I got the opportunity to learn proper technique and methods”. 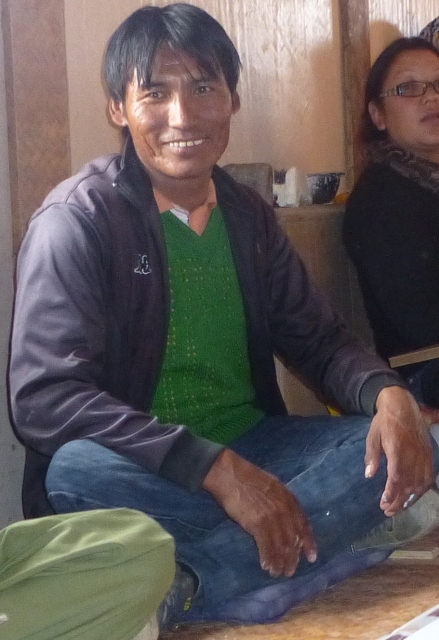 In this manner he started to learn sewing and stitching and started his own shop in the city of Leh. He also tried to do business in his own village. He was not able to earn much through his tailoring business so he started a small restaurant shop for some years. Later on he met one of the PAGIR staff in Leh and came to know about PAGIR. He has been part of PAGIR for the past two years. He is involved with PAGIR as an artisan and also helps them in creating awareness among the disabled people in Jammu and Kashmir. Now he is living in Leh and has also built his own house. He also bought a car so that he can commute to office daily as it is difficult for him to walk for long distances. Driving the car was a big achievement for him as he uses one leg to control the gear and the brake paddle. Artisans in PAGIR make products from tailors waste and paper which are bought by MESH.